Every girl needs a good set of makeup brushes in her collection. Nowadays, there are many different types of brushes out there, all designed to contour, blend and buff your way to a flawless makeup look. But with so many options to choose from, it can be hard to know which way to lean. Luckily, we’re here to help. 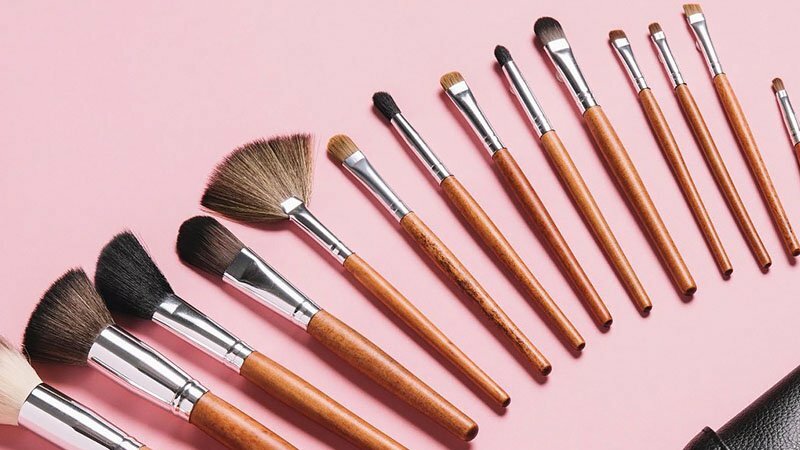 Whether you’re an amateur or professional makeup artist, these are the best makeup brushes for every beauty enthusiast. The E.l.f. 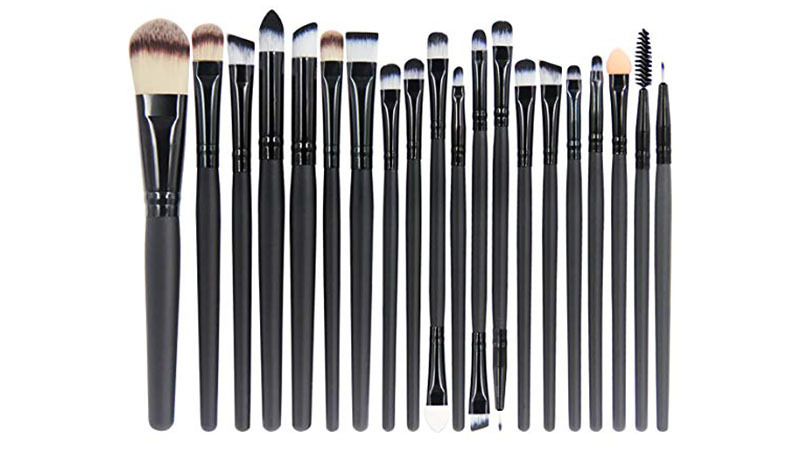 Cosmetics 12 Piece Brush Set is designed to help you create flawless makeup looks. 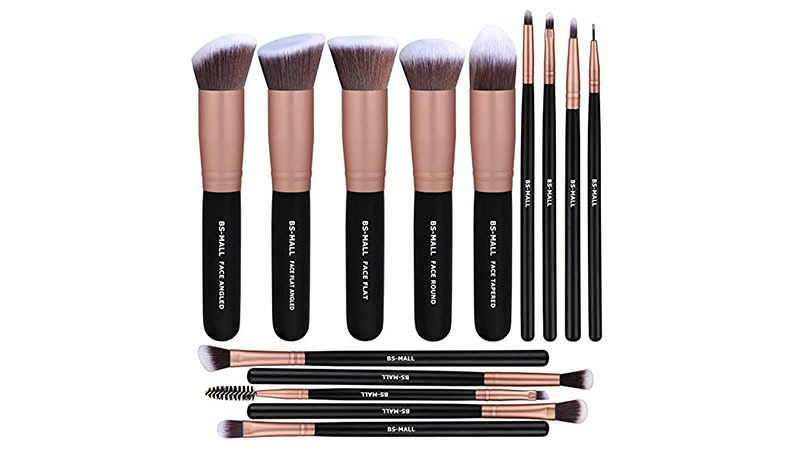 The set includes a foundation, blending eye and concealer brushes in addition to an eyeliner, eyelash and brow wand, lip defining brush and brow comb. It’s got all areas of the face covered, and it is suitable for all types of makeup users from beginner to professional artist. Furthermore, the kit comes with detailed instructions to help with your application. For a soft but firm makeup application, you need the BS-MALL 14 Piece Makeup Brush Set. 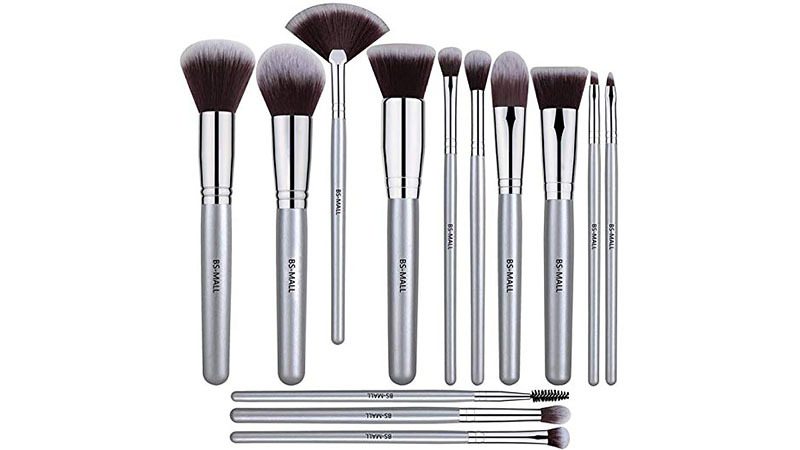 Featuring five basic kabuki brushes as well as nine precise eye makeup tools, the set is soft and silky to the touch. They are dense, high-quality and shaped well, with strong bristles that will not shed during the makeup application process. Shop BS-MALL’s selection of synthetic brushes, cosmetic tools and applicators to ensure perfect results. 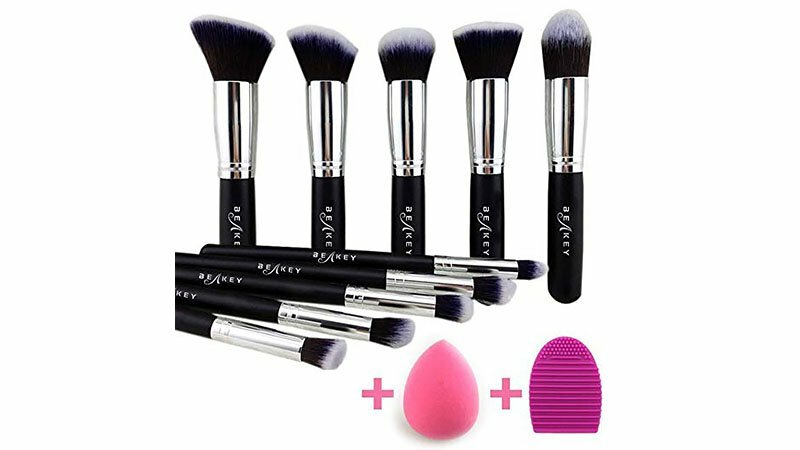 The Bestope Makeup Brush 16 Piece Set has everything you need for face and eye makeup application. 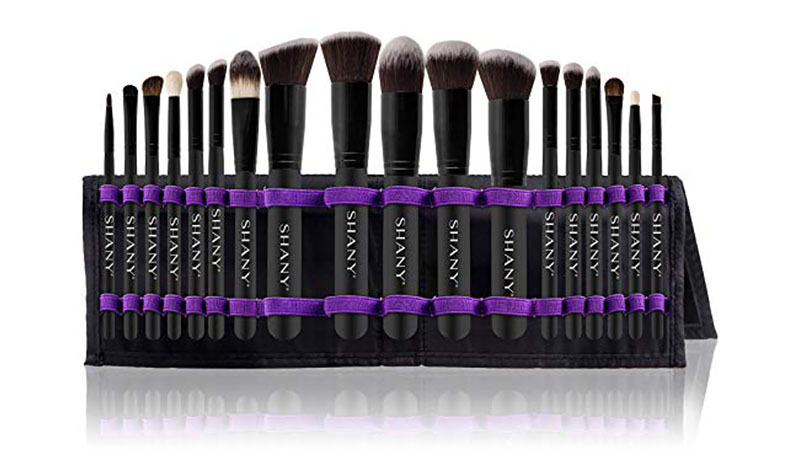 The premium synthetic set features five kabuki brushes in addition to 11 precise cosmetic ones. Made with soft and dense synthetic fibres, Bestope’s brushes offer a high definition finish with powder, liquid or cream foundation without any product absorption. The set provides all different types of brushes to carve and sculpt the face, ideal for blending and highlighting as well as contouring. It is perfect for both amateurs and professional makeup artists alike. The Beakey Makeup Brush Set is the perfect kit for a stunning face and eye makeup application. It features high quality, non-irritating synthetic brushes which are high density and soft to the touch. 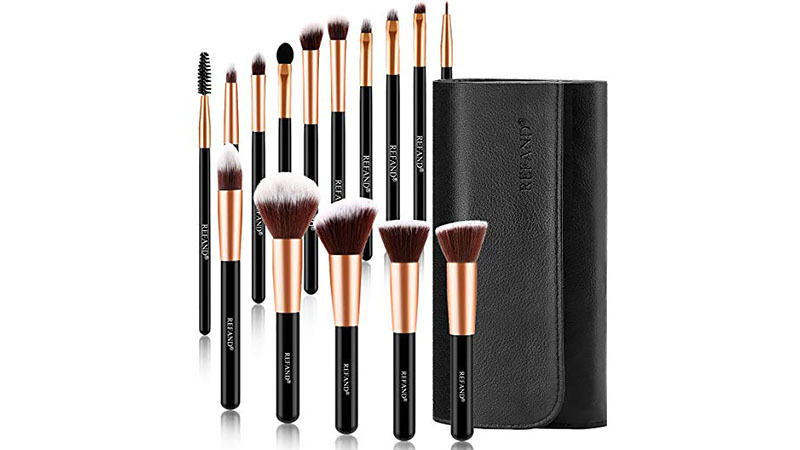 The set contains ten makeup brushes, one makeup sponge as well as a brush cleaner. It is the perfect kit for powder, liquid or cream makeup products. Above all, they do not shed! 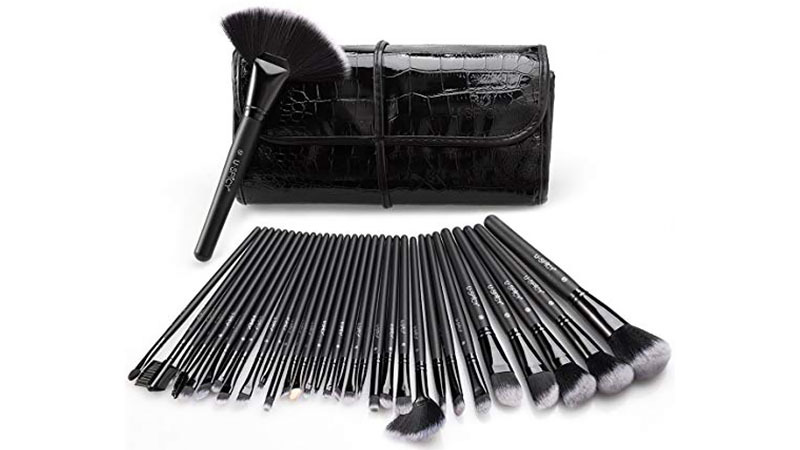 The USpicy 32 Piece Makeup Brush Set will make for the perfect gift for the makeup lover in your life. It comes with a travel pouch designed to protect and store all your cosmetic brushes. The set is great for all kinds of makeup, from concealer to blush to eyeshadow and more. USpicy’s brushes are silky soft and smooth to the touch, perfect for makeup artists and professional cosmetic use, but equally handy for beginners. 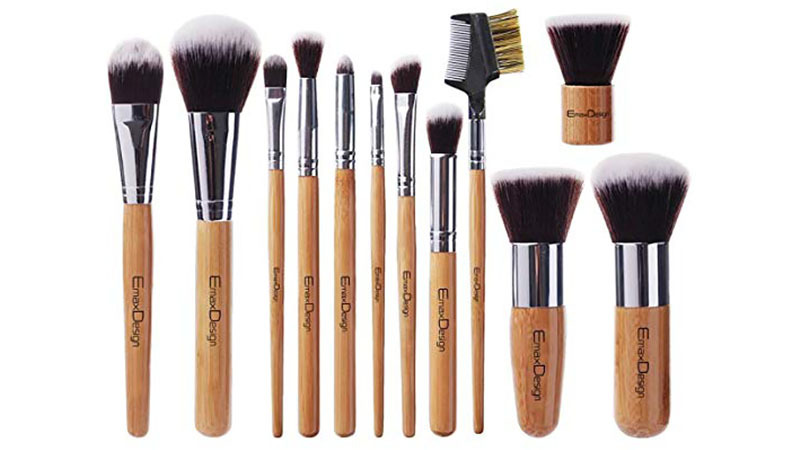 The EmaxDesign 12 Piece Makeup Brush Set features handmade brushes made of premium synthetic fibre. The kit includes a foundation and powder as well as an eyeshadow and eyelash brushes. Designed by a professional makeup artist, they are certainly ensured for long time use. All brushes are made of high-quality bamboo, offering a sense of luxury. In addition, the set also features a portable bag for easy travel and storage. The Refand 15 Piece Makeup Brush Kit features handmade brushes made of premium synthetic fibre for incredible touch and feel. This must-have brush set is ideal for liquid, powder, or cream application and will help you to produce a stunning makeup look every time. The kit includes a foundation, eyeshadow, mascara, blush, eyebrow brushes and more, and also comes in a protective leather bag. In short, the multi-functional brush set has everything you need for a flawless cosmetic application and is easy and convenient for day-to-day use. If you’re a makeup professional, then you need Shany Artisan’s Easel 18 Piece Cosmetics Collection. Professional grade synthetic and natural hair bristles make up the brushes. It is one of the most used brush brands in the industry. The kit contains kabuki and eye as well as face and foundation brushes. It also comes with a water and dust resistant pouch that doubles as an upright easel – perfect for makeup artists on the go! Above all, Shany’s products are cruelty-free. 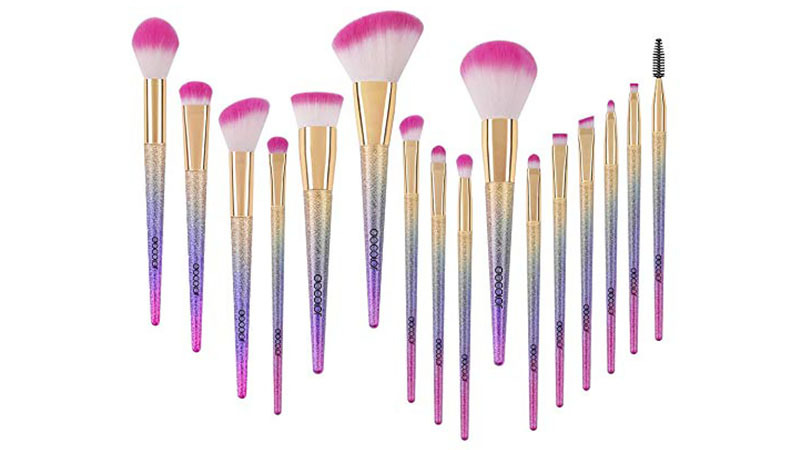 If you’re after a gift for the makeup lover in your life, you need the Docolor 16 Piece Fantasy Makeup Brush Kit. Housed in a stunning rainbow box, the scratch and fade proof brushes are created for stability and durability. In addition, these synthetic brushes are made to maximise liquid or cream application, made 100% cruelty-free. Above all, Docolor’s professionally designed, high-quality brushes contain smooth and soft hypoallergenic bristles that can pick up product efficiently and without waste. 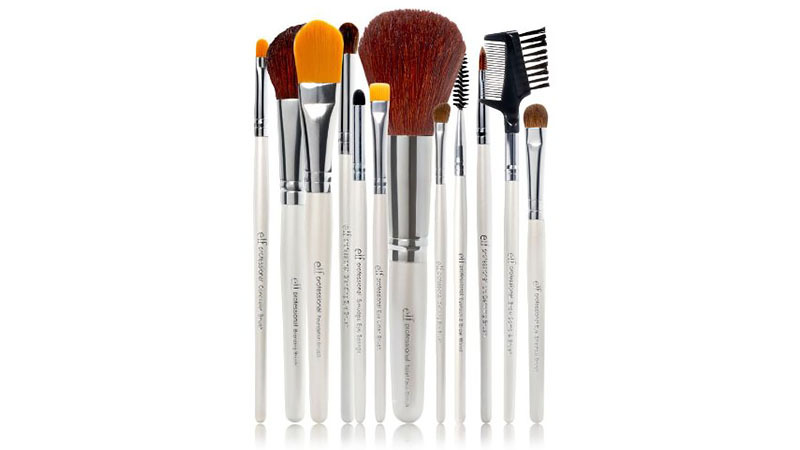 The EmaxDesign 20 Piece Makeup Brush Set has every tool you need for a full face makeup application. The kit includes an eyeshadow, foundation and eyebrow brushes as well as eyeliner, concealer and mascara brushes. Each brush is easy-to-use and non-irritable, making them suitable for individuals with even the most sensitive skin. 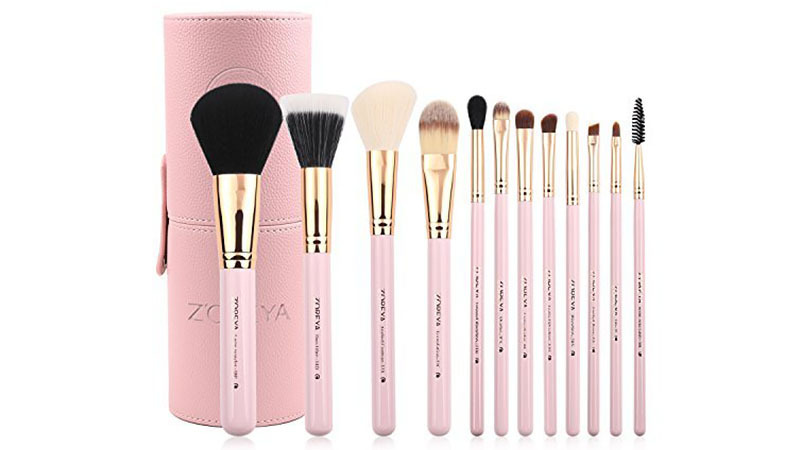 For a precise makeup application, you need Zoreya’s 12 Piece Makeup Brush Set. 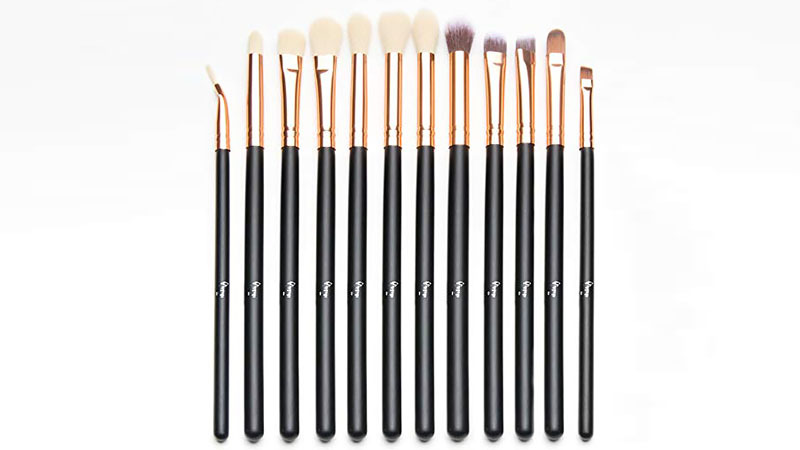 The kit, which contains five kabuki brushes in addition to seven precise cosmetic brushes, is ideal for blending, shading, highlighting and contouring. The brushes are non-irritating and non-shedding, made from premium synthetic hair. Above all, Zoreya’s high-end wooden brush handles ensure a smooth and professional cosmetic application. The Qivange Eye Brush Set allows you to create a variety of eye makeup looks. The 12 piece set includes concealer, blending and eyeshadow, as well as eyebrows and bent eyeliner brush. With soft synthetic bristles and durable handles, these cruelty-free brushes are non-shedding. Meanwhile, the chic rose gold and black design is a must-have in your makeup collection! The BS-Mall 13 Piece Makeup Brush Set provides an assortment of brushes for your makeup application. The kit includes foundation, kabuki and eyeshadow brushes, as well as a lip liner, powder and blush brushes. Each brush is soft and silky to the touch, yet still firm and shaped well. Made of the highest quality material, the brushes certainly do not shed. 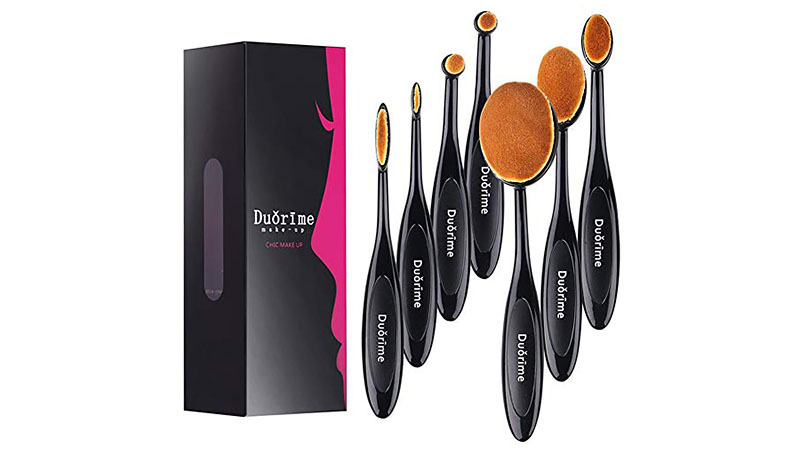 The Duorime 7 Piece Oval Makeup Brush Set is a revolutionary and universal product. The brushes are designed for a flawless cosmetic and makeup application made with well selected raw synthetic fibre. They have been tested by many make-up artists, and are subsequently loved by many beauty enthusiasts for their versatility. 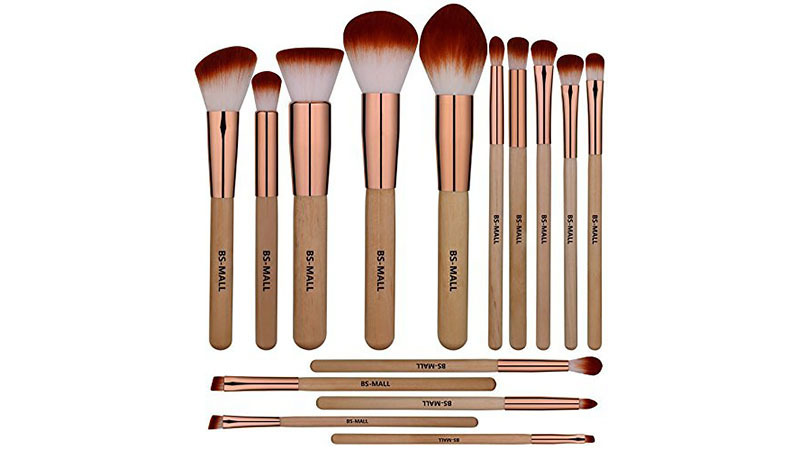 The BS-Mall 15 Piece Wooden Makeup Brush Set makes makeup application a luxurious experience. The kit is perfect for both makeup beginners and professionals alike. 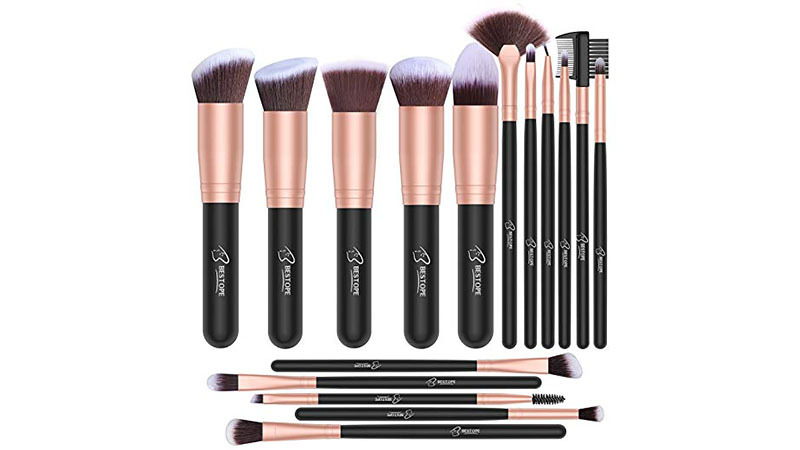 It features five different types of brushes (round, angled, flat, tapered and flat angled), providing an easy and professional finish on every application. To sum up, BS-Mall’s brushes are dense and shaped well, made from high-density bristle.